Thornybush is a 14,500 hectare reserve which has open boundaries to the Kruger and a high density of animals, including the Big 5. The nearest airport to Thornybush Game Reserve is Hoedspruit Airport (HDS), and this is the airport that visitors should use if possible. Hoedspruit Airport has direct flights from Johannesburg only. 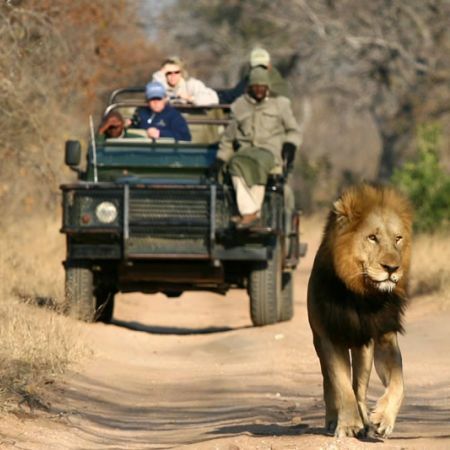 The Thornybush Game Reserve is a 14,500 hectare private reserve tucked away just west of Timbavati and the Greater Kruger Park. A mixture of open savannah, rolling lowveld and rambling prickly scrub with a dramatic backdrop of the Drakensberg Mountains, it’s a reserve that really captures the spirit of a South African safari. The reserve now has an open border with the Kruger National Park, so you can expect an exciting Big Five safari that will stick with you forever. As well as the Big Five, the reserve is home to a further 142 mammals species, 114 kinds of reptile, 507 types of bird and 336 tree species. This makes it a superb safari haven for both wildlife and nature lovers. Staying at one of the lodges within the reserve, you’ll be treated to sunrise and sunset game drives to explore the hills and valleys of Thornybush on the lookout for wildlife with an expert tracker and professional game ranger. As the reserve is private, the rangers are not limited to the roads, so you can stray deep into the bush in search of close encounters with the animals. This adds an extra dimension of excitement to the whole safari experience. What’s more, you can also opt for spot-lit night safaris and guided nature walks, both designed to give you a different take on the South African bush. The great news is that Thornybush is wonderful for wildlife at all times of year. During the peak tourist season to South Africa, from December to April, the landscape is lush and green due to the summer rains. At this time of year, Thornybush is brilliant for birders and a-buzz with newborn animals, which in turn brings out the predators. Then, from May to October, the weather is cool and dry, with the sparse bush making for easy wildlife-spotting in comfortable temperatures. In October, the build up to the rainy season begins and temperatures start to soar, bringing a steady flow of animals out to the waterholes until the rains return again in December. The standard of accommodation in Thornybush is excellent. There’s a handful of atmospheric alternatives to choose from, ranging from vintage-style safari tents to rustic thatched chalets and hidden forest suites. Each lodge offers a full range of creature comforts, from private viewing decks to spa treatment rooms and swimming pools perfect for refreshing dips between game drives. Several of the lodges in Thornybush Game Reserve welcome children, offering spacious family suites or rooms and a great variety of activities for kids. These family-friendly lodges include Jackalberry Lodge, Monwana Game Lodge and Thornybush Game Lodge, and Saseka Tented Camp has a private 2 bedroomed villa complete with it's own dedicated safari vehicle. If you’re seeking a more romantic safari escape, Saseka and Chapungu offer an indulgent sleeping experience under canvas, and Royal Malewane, Shumbalala Lodge and Serondella Lodge are intimate lodges with added emphasis on luxury, making them perfect for starry-eyed couples of all ages. n'Kaya Game Lodge is situated in the Thornybush Game Reserve, and boasts a spectacular view of the surrounding savanna and the famous Drakensberg mountain range from its hilltop perch. Chapungu Luxury Tented Camp accommodates a maximum of 16 guests in 8 air-conditioned en-suite tents. Each safari tent is authentically furnished in colonial splendour, enhancing the ambience and comforts typical of a bygone era. Waterbuck Game Lodge is positioned adjacent to a water estuary in the southern part of the Thornybush Nature Reserve. The lodge boasts 4 air-conditioned luxury suites with magnificent views from both the generous sized bedroom and en-suite bathrooms. .
Serondella Lodge can accommodate guests in 3 suites and one family suite (with 3 bedrooms), all under deep African-style thatch and lining the banks of a dry riverbed nestled amongst magnificent tall trees. Suspended wooden walkways link treetop hides to the luxuriously appointed suites. The award winning Monwana Game Lodge is located within the 14,500 hectare Thornybush Game Reserve, part of the Greater Kruger National Park. Each of the 5 rooms has its own private deck or patio overlooking rugged bushveld or a busy watering hole. The majestic Drakensberg Mountains provide a spectacular backdrop for Jackalberry Safari Lodge. Accommodation is in rustic chalet style rooms, and game drives are taken every morning and evening with highly trained rangers and trackers.